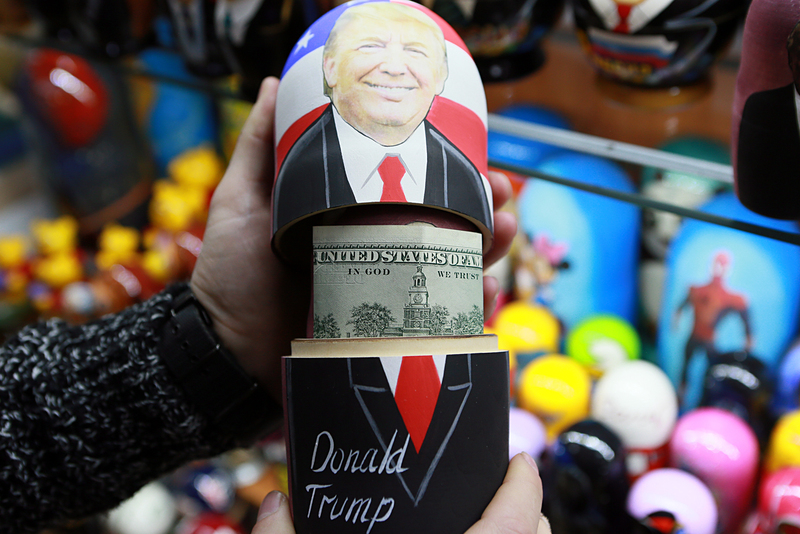 Russian matryoshka dolls with portraits of Donald Trump at a souvenir shop. Political themes have become popular with souvenir makers. Donald Trump’s election to the US presidency has spawned a bunch of souvenir T-shirts with his catchphrases, which Russian entrepreneurs are looking to get patented. Russian manufacturers of souvenirs have responded with creativity to Donald Trump’s victory in the US presidential elections. Rospatent is now registering a series of high-profile statements that Trump made about Russia and Putin, as trademarks. Incumbent US President Barack Obama was much less popular with Russian T-shirt manufacturers. “Putin is stronger than our president”, “Putin is a strong leader. I cannot even imagine what I’d like to achieve more than having a friendly Russia”, and “I’m not going to tell Putin what to do”. These lines will be accompanied by a portrait of Trump. Tarasov has also decided to recall such milestones of friendship between Russia and the United States as the docking in space of the Soviet spacecraft Soyuz-19 and the American Apollo, which became known as the “handshake in space”, and to patent the trademark “Apollo Alliance”. All trademarks are being registered in the categories of “clothing, footwear, and headgear”. Anatoly Aronov, President of the First Patent Company, says it is unlikely that these trademarks will receive patent protection. However, the applicant has no intention of waiting for this registration. “Registering takes about one year, and by the time that Rospatent makes a decision on this, the project would already have been forgotten. This should be understood by the applicant himself. Applications are filed, just to play it safe. Should any claims arise (which is unlikely, since Trump himself would have to apply), it will be possible for us to answer that for now, state presses are on, seeking the permissibility of using such trademarks. Now they can calmly proceed with the work,” Aronov believes. He noted that this project would be relevant for a few months; but it could be quite successful. “This is quick money; sales will be brisk for a few months, while all are still excited at the prospect of friendship between Russia and the USA. As soon as this wave passes, people will stop wearing the shirts. But in the short term, there is time to make some money,” said Aronov. A similar view is shared by Tatiana Komissarova, Dean of the Graduate School of Marketing. “This is a good idea. Such projects do not bring long-term income but, in the short term, this will work. And given the large margins (in general, such products are made in China), in a short time, they should be able to earn good money,” she said. According the Komissarova, politics is now one of the main drivers in the souvenirs market. T-shirts, devoted to political themes, became a notable trend in the market since 2014, when the AnyaVanya Company brought to the market a new collection called ‘VsyePutem’, inspired by political events of the time. T-shirts with the image of Putin with the caption “The most polite man”, “They’re not going to get us”, and Crimea, formed part of this collection. According to media reports, total revenues from this collection amounted to 15.6 million rubles. Many other Russian brands also released patriotic collections. Other than Putin, they also began to use images of other popular politicians, like Defence Minister Sergey Shoigu and Minister of Foreign Affairs Sergey Lavrov. Soon the patriotic theme became commonplace, adding to the list of “cool prints”, which were offered by online print shops. The current president of the USA has been poorly represented in their portfolio, but now there are several prints available with the theme “Obama – schmuck”.